UK: The head of Odeon-UCI, europe’s largest cinema group is stepping down. “Sky News understands that Rupert Gavin, who has run the privately-owned group for eight years, is to leave a year after its owner abandoned its latest attempt to sell the company. Mr Gavin will be replaced by Paul Donovan, a former executive at Vodafone and Eircom, the Irish telecoms group.” With Cineworld’s Steve Wiener having announced that he is leaving prior to the announcement of the merger with CCI, this leaves Vue’s Tim Richards as the doyen of the UK exhibition business. However, “Mr Gavin would become an adviser to Terra Firma and join the board of Garden Centre Group. The outgoing Odeon UCI boss will also spend more time at Incidental Colman, his privately-owned theatre and entertainment group.” Link. India: Youth killed after fight in cinema. “The youth was fatally stabbed by a group in the aftermath of a quarrel which broke out while watching newly-released Tamil film ‘Veeram’ on Wednesday. In the clash that ensued on a playground, two others sustained injuries and were hospitalised.” Link. Int’l: Harkness has released the third iteration of its popular screen calculation tool – as an app. From FJI: “The Digital Screen Calculator is a free utility on iOS, Android and through the Harkness website that allows engineers and exhibitors to ensure that digital-cinema investments are fully optimized. The tool calculates the capabilities of equipment choices and provides recommendations on projector, lamp and screen choices based upon chosen screen size and light levels for 2D and 3D. It also calculates theoretical operating costs and shows how screen choice might reduce these dramatically.” Link. China: Parents are pushing for better 3D glasses for children. “Some parents said they were more concerned about hygiene and worried about infectious diseases. Moreover, all 3D glasses in cinemas are the same — too heavy and big for children. Local cinema houses said smaller-sized 3D glasses are available in certain theaters. They said parents can buy small 3D glasses for children.” Link. Poland: “Orange Poland continues the series of Kino Orange cinema travelling over Poland to bring cinema to municipalities which do not have any. In January, it will bring five premiere films, of which two in 3D. Kino Orange is a joint project of the company Outdoor Cinema and Orange Poland.” Technology used is NEC projectors and XpanD 3D glasses. Link. Netherlands: Games on the big screen. “On January 25, five students of the Hanze University Groningen will organize the event FIFA 14 in the Wolff Cinema in Groningen. 100 participants will be playing the football game FIFA 14 from 12:00 to 19:00 for a chance to win the tournament title.” Link. India. “The newly appointed Censor Board CEO, Rakesh Kumar, a former Indian Railways officer, has given his first interview to a tabloid and he has spoken the way a man who has as much understanding of cinema as any lay man is expected to have and tries to give impressive views on occupying a hot seat generally talks. He has revealed his inability to understand the motion picture industry’s current scenario and the demands of the audience which fills the multiplex cinemas and more specially the single screen cinemas in the country today.” Ouch! Link. USA: “Marcus Theatres, a division of The Marcus Corporation (NYSE:MCS), has announced new details about its planned cinema at the Prairie Lakes development in Sun Prairie, Wis. The company is under contract to purchase an 11.6-acre site for the new 12-screen theatre, which is anticipated to open in time for the 2014 holiday movie season.” Link. Romania: “Sonae Sierra, developer of River Plaza Mall in Ramnicu Valcea, announces the launch of Line Cinema complex within the mall. The new entertaining features the latest box office cinema movie productions, including 3D productions within the two cinema halls to host 200 spectators.” Link. 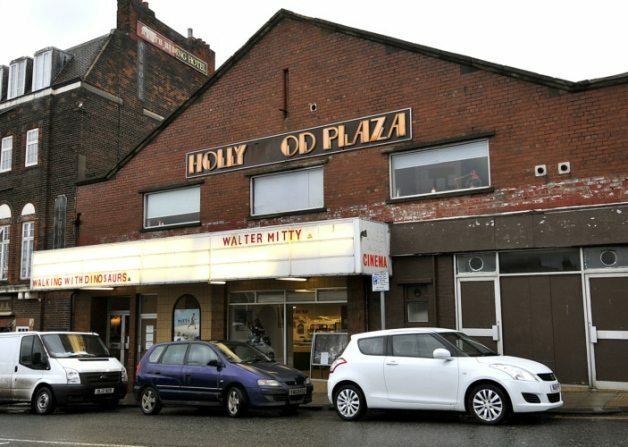 UK: Linconshire’s likelihood of restoring its Ritzy Cinema, part of which was converted in Weatherspoons pub, is in doubt. “The company that runs Lincoln’s famous Ritz cinema complex could face a winding-up petition if it fails to pay debts totalling almost £5,000. Oldham-based entertainment agents Handshake Ltd is threatening to petition for it to be wound-up after it failed to comply with a court order.” The money was owed for the appearance of “comedian” Roy ‘Chubby’ Brown. Link. UK: “Scarborough’s Hollywood Plaza is set to benefit from a major programme of investment and refurbishment – starting with £35,000 worth of digital projection equipment. The two-screen venue in North Marine Road, which seats 275 people, is now Scarborough’s main choice for cinemagoers following the closure of the Futurist.” Hopefully they will also be able to afford some better signage. Link. “Suchitra Sen, a veteran Indian actress known as India cinema’s Greta Garbo, has died in the eastern city of Kolkata. The 82-year-old actress had been hospitalised a month ago following a chest infection and doctors said her condition had deteriorated. She died following a massive heart attack on Friday, according to agency reports.